Imager Focal Plane Array (FPA), un-cooled Vanadium Oxide microbolometer with user-selectable on-screen temperature display (spot meter) and alarm- 7.5 Hz NTSC, 8.3 Hz PAL- 30 Hz NTSC, 25 Hz PAL; US export license may be required. Refer to the section “Installation/configuration notes” for more details. 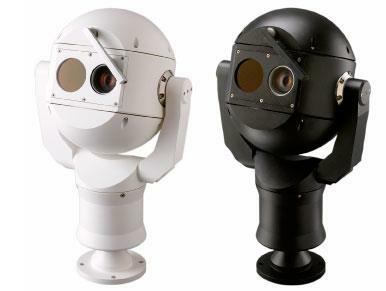 Imager Focal Plane Array (FPA), un-cooled Vanadium Oxide microbolometer - 7.5 Hz NTSC, 8.3 Hz PAL- 30 Hz NTSC, 25 Hz PAL; US export license may be required. Refer to the section “Installation/configuration notes” for more details. Software CTFID software allows direct connection to a USB-equipped PC via the MIC Series PSU over a full duplex to provide access to all camera functions and useful diagnostic tools. 24 VAC, 50/60 Hz power supply with two video outputs for MIC Series cameras. 115 VAC, 50/60 Hz power supply with two video outputs for MIC Series cameras. 230 VAC, 50/60 Hz power supply with two video outputs for MIC Series cameras. Replacement silicone wiper assembly (single wiper blade and associated hardware) for MIC612 and MIC412 cameras, silver. Replacement silicone wiper assembly (single wiper blade and associated hardware) for MIC612 and MIC412 cameras, black.